Sump pumps are the heart of a good waterproofing system. In many homes, the sump pumps are old, unreliable, and create moisture and health problems in their basements or crawl spaces. The “builder’s grade” sump pumps that many of us have are unreliable and inefficient, and they do not provide the features we need. 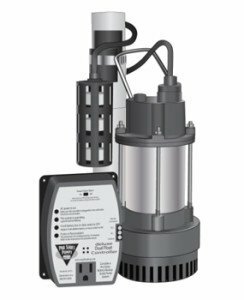 Today, very efficient high capacity sump pumps are available, like the ECP BSP50. Now you can change out your old sump pump with a new modern sump pump. Modern sealed sump pump installation is highly reliable and runs at optimal performance levels. Combining the pump systems with a sealed interior waterproofing or drainage system will increase the value of your home as well as create the option of a new, healthy living space. Almost always, a sump pump is a great addition or upgrade to your basement. Do not risk your basement flooding due to an out of date, unreliable, builder’s grade sump pump. Today’s sump equipment is very reliable and adds to the health of your home. Quality waterproofing contractors have affordable and reliable sump pumps available, including single pump systems, battery backup sump pumps, and water alarms that keep your basement or crawlspace dry and healthy. Earth Contact Products (ECP) sump pump systems are the very best in the industry. Each sump pump system is designed to work in conjunction with a sealed basement waterproofing system to keep your basement dry all the time. These systems must be installed by trained sump pump installers like the ones at Reliable Waterproofing & Masonry.